If you find a castle in town you know there’s been trouble … and the bigger the castle the bigger the trouble. Bump into Castel Sant’Elmo, with Vesuvius just there, and you realise that you probably have no idea what ‘trouble’ even is. When we visited there was trouble. Only minor trouble but it came with the grinding smell of over-heated engine oil. The invader this time was a small white lorry that eventually scraped a turn where there should have been none. For us it was a lesson in underestimation – never misjudge the determination of the Neapolitan who feels he might be denied access. Don Pedro di Toledo did not. His task, as viceroy of Naples from 1532 to 1553, was to bring order and progress to the city on behalf of the Holy Roman Emperor, Charles V. He had a lot to do – the city was abused, disorganised and plague-prone, and it also faced continual threats from the French, the Turks and from local rivals, including belligerent barons. Don Pedro decided to take a look at the city’s defences, amongst them Belforte, the castle founded by Robert of Anjou in 1329. The location was fine but Don Pedro wanted a rebuild. Work started in 1537 and took nine years to complete. When finished its ‘I’m-in-town-for-good’ message was clear. 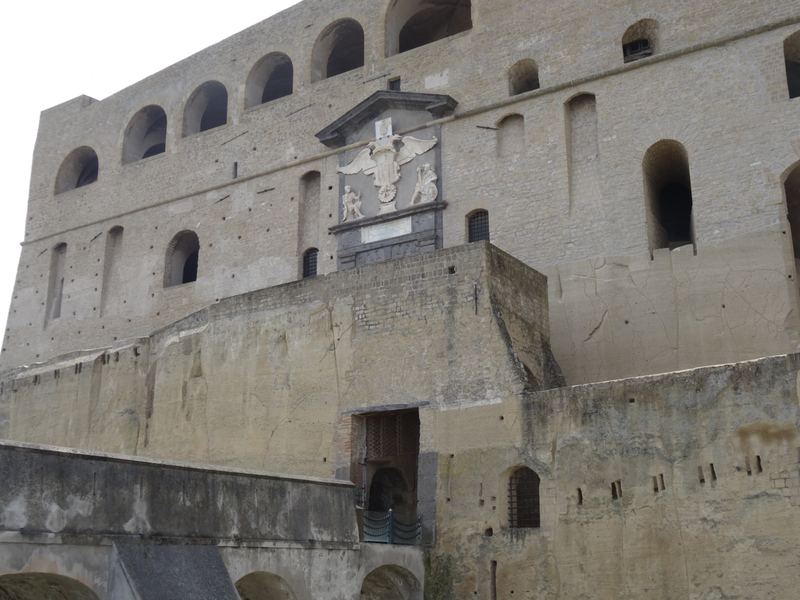 The fortress, now known as Castel Sant’Elmo, has massive walls of pale ‘yellow Neapolitan tuff’, and sits at the top of the city on constant look out, carved from the ground that it’s been built to hold. You might think that solid equals ugly but somehow it doesn’t. Visit the top of the castle and it’s like freeing a bird – you are at the highest point for miles with views in all directions. 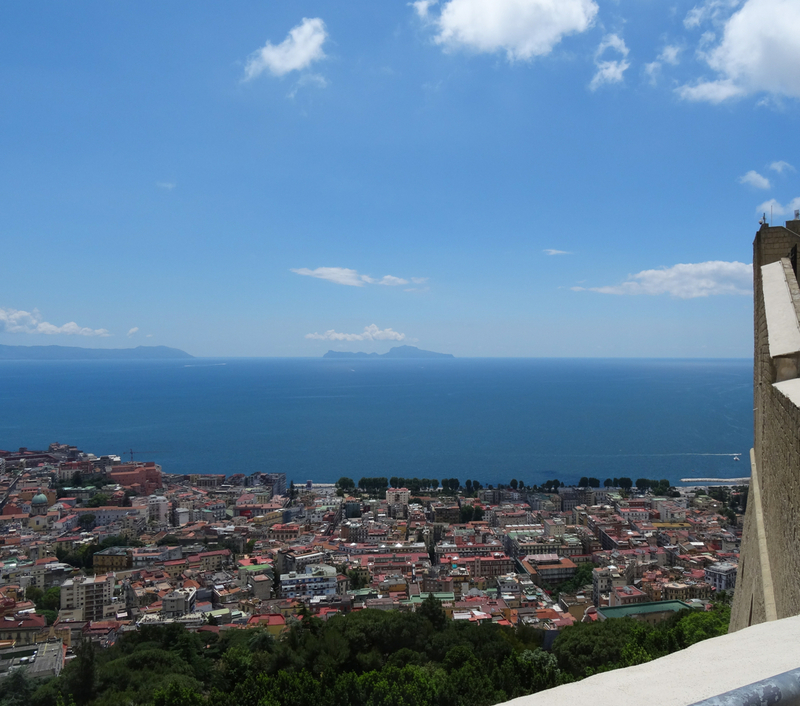 To one side there is Vesuvius and Capri, then the scene sweeps round over the Bay to where Capo Miseno, and the islands of Procida and Ischia fade against the distance. From that view turn in either direction and i mille colori, the thousand colours, of the city patchwork up against the volcanic hills behind. Since Don Pedro’s day the castle has buttressed its way through most events, only flinching at a lightning strike in 1587 which hit its ammunition supplies. The huge explosion killed a 150 and plummeted debris on to the city below … but by 1610 repairs had been completed. 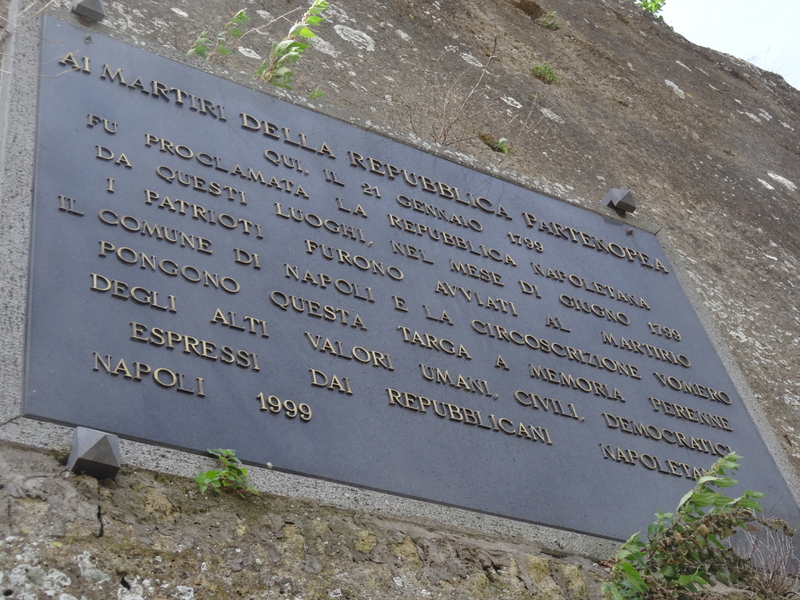 Then, just under 200 years later, there was a different kind of trouble at Castel Sant’Elmo – political trouble commemorated by a plaque on the wall of the castle about a hundred metres down the hill from the visitors’ entrance. Like a dark stain it remembers those who died for the ‘Parthenopean Republic’ in 1799, amongst them a number of local intellectuals and professionals who supported the republican ideals that the French had brought south through Italy with their army – ideals that had sent the royal family of Naples rushing across the sea to Sicily. The new republican order did not last long. Then? It seems that King Ferdinand’s wife, Maria Carolina – daughter of the Empress of Austria, and sister to Marie Antoinette who had been beheaded in France – did not take kindly to republicans. One point of view is that she, assisted by the persuasive talents of her great friend Emma Hamilton (who was wife of the British Ambassador in Naples and keen ‘friend’ of Nelson) may have persuaded her King and the British naval commander, to stop the ships sailing and to find the local ringleaders. Terrible consequences followed – the gallows and firing squads ended the lives of some of the city’s finest intellectuals, whilst the courts sent others into prison or exile. The stiff dark lettering on the implacable walls of Castel Sant’ Elmo are a reminder of that time. 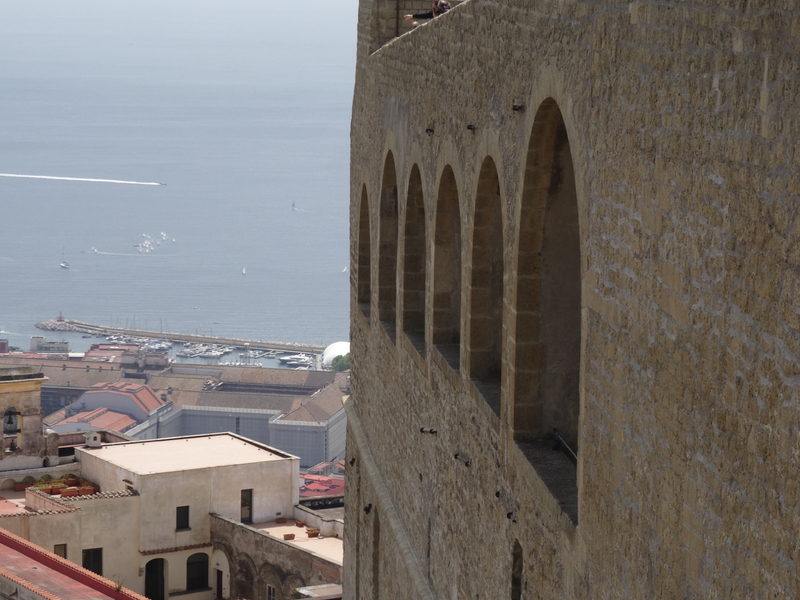 1799, from whichever way you look at it, was a murderous year in the history of Naples … but it was by no means the only one, and the strength of the castle walls suggest that Don Pedro di Toledo was never in any doubt that the city would attract trouble for many years to come. Today his castle still stands and it has taken on many roles since it was built – fortress, prison, sanctuary, and now tourist attraction and art gallery. 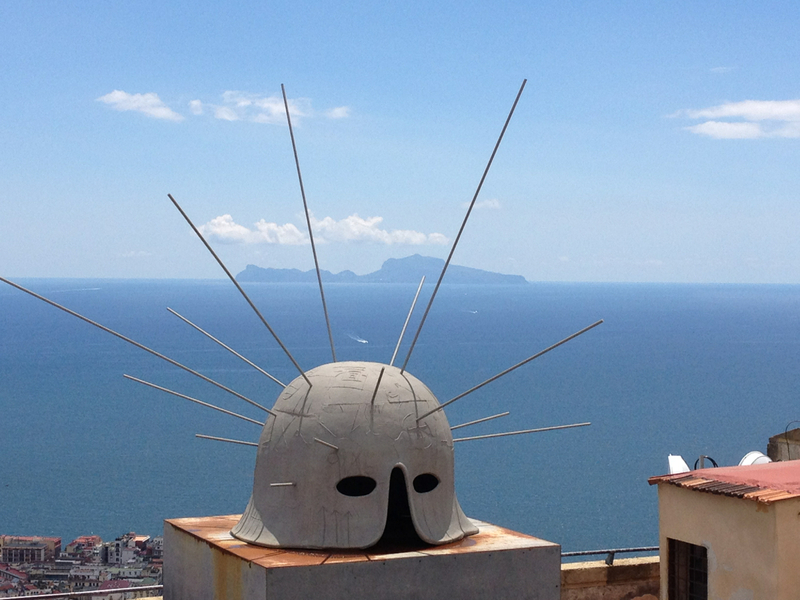 It is bulky and unmissable … a memorial to man’s madness set high above the Bay of Naples. 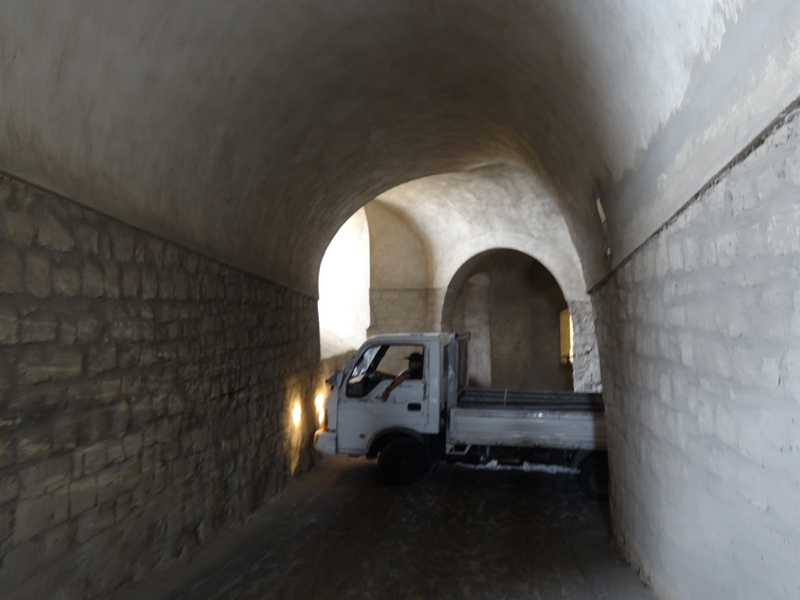 This entry was posted in Italy, Naples, Places to see in Naples and tagged Admiral Horatio Nelson, Castel Sant'Elmo, Charles V, don Pedro de Toledo, Emma Hamiliton, Holy Roman Emperor, Mimmo Paladino, Naples, Parthenopean Republic. Bookmark the permalink. 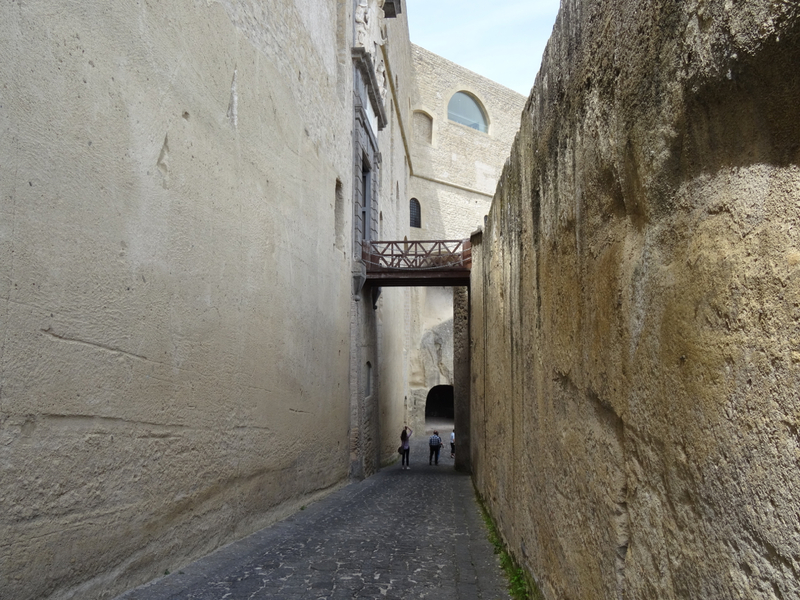 A look back (first published on 12 June 2015): Castel Sant’Elmo is a great starting point for any visitor to Naples. Stand on its ramparts and it’s like being part of an enormous 3D map of the city and its bay. Naples has stunning views and Capri has my heart. But the shady areas and creeps walking around (roaming, in fact!) sure gave me the creeps! 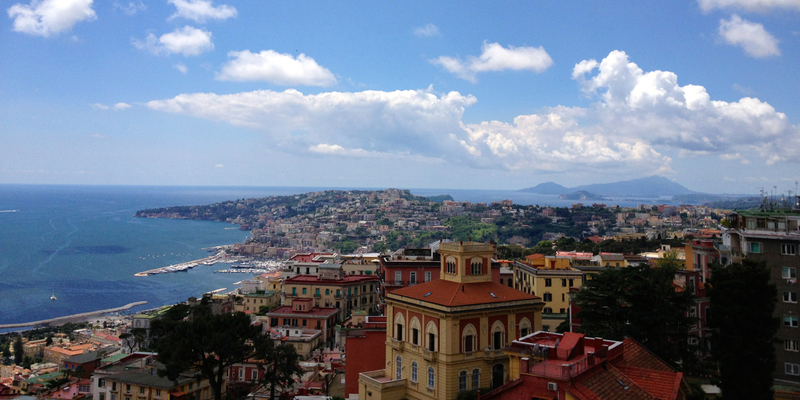 Hi Escape Hunter – glad you’ve found the views and hope you find the time to see more of Napoli – the more time and the more Italian you have the easier it is. Not sure where you were walking but I have walked miles through the city and only had good experiences. As in most cities I’d recommend taking more care around the central station. Hope you’ll be back! Brilliant article and I loved the start but terrible to learn about the fate of the republicans. Horrible! I hope Emma Hamilton had their deaths on her conscience. I didn’t understand why you said at the end “a man’s madness”? 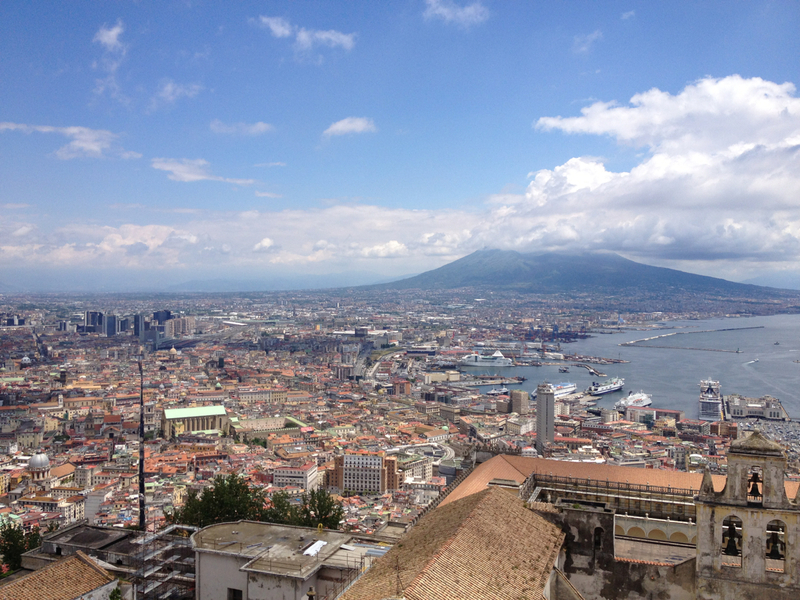 Feel I am getting to know Naples – thanks to you Georgie….can’t wait to get there and see it !! So looking forward to seeing you here … a city for all the senses. Perfect for travelling artists! It is amazing Lyn – what fascinates me is how durable buildings are in this area thanks to the by-products of the devastating volcanic eruptions. The soil and the rock seem to have been forged with extra strength in their DNA which the Romans then learned to harness for their own projects, and then passed the knowledge on through the generations. It is, I think, like the Chinese word for ‘crisis’ – a mixture of danger and opportunity.